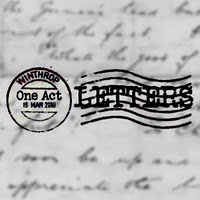 Letters is Winthrop High School’s 2010 One Act play written by David Setchell, Tiff Shaw, and Karen Rice. Performed at the Cony High School at the One Act Competition, it brought home FIRST PLACE along with several awards. In the Maine state competition, Letters placed third and the actors received many awards. Instead of comedy, this year’s Winthrop One Act was focused on today’s pressing social issues: Drug abuse, teen pregnancy, war, and family relationships. The result was a production that brought the audience to tears. This is a MUST HAVE item for anyone who likes great acting and great scriptwriting coming together in a whirlwind of excellence. The DVD also includes footage of David Setchell taking a sledgehammer to the regional trophy.